Guest Accommodation OWNER SUITE king size bed with shower room en suite and spa pool bath GUESTS 2 x VIP guest cabins with shower rooms en suite - each with queen size bed 1 study with shower room en suite - queen size sofa bed for 2 guests 1 x twin cabin with shower room en suite - two twin beds with single pullman. The 155.84ft (47.50m) motor sailor MITseaAH was built by Pendennis shipyard in England in 2004 to the stylish designs of Liebowitz & Pritchard. 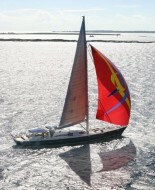 MITseaAH, is a very special luxury sailing yacht and one of the most ground breaking launches of 2004. Designed for high performance cruising under engine (20 knots!) and sail, her stunning looks and first class pedigree give this yacht unmatched appeal. 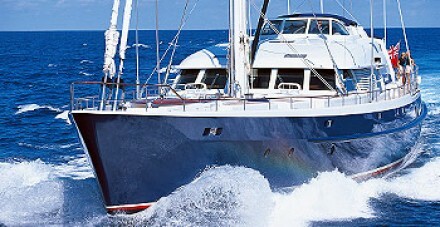 MITseaAH boasts all the sailing excitement with motor yacht comfort and speed. She is capable of motoring to an excess of 22 knots; her 730 square meters of sail also power her through the water when there is a nice breeze to utilise. Away from the excitement of sailing MITseaAH interior presents a more tranquil and relaxed mood. The layout and configuration provide for very comfortable living with an excellent capacity for both formal and informal entertaining provided on the below deck in the stylish lower saloon and dining room. MITseaAH offers beautifully appointed accommodation is provided for 12 guests, including the Owner’s suite, with three further double cabins and one twin cabin aft completing the guest accommodation. Her elegant interior features polished mahogany, exquisite fabrics with state of the art equipment fitted throughout, providing an extensive audio visual entertainment system. The impressive decks offer plenty of space for al fresco dining and entertaining as well as providing the perfect areas to soak up the sun or relaxing in the spa pool. Tenders & Toys 1 x 20ft (6.00m) Riva Junior tender 1 x Castoldi jet drive tender 1 x Bauer diving compressor 6 x sets of diving equipment 1 x Spa Pool dip pool forward 1 x Computerized treadmill. Yacht Disclaimer: The Yachts and their particulars displayed in the results above are displayed in good faith and whilst believed to be correct are not guaranteed. All information is subject to change without notice and is without warrantee. Asking prices are shown in a range of currencies. Legal Conditions of Use | contact us | site map | yacht directory Copyright © 2005-2015 - Boatworld.com - All Rights Reserved.